National Doughnut Day is celebrated in the U.S. on the first Friday of June each year. It was started by the Salvation Army in 1938 to honor their members who served doughnuts to soldiers during World War I. Many national chains and independent shops in Las Vegas are offering specials today, including free doughnuts with or without purchase. Postcard US-2317873 to Russia shows a Voodoo Doll doughnut, one of those raised yeast doughnuts filled with raspberry jelly topped with chocolate frosting and a pretzel stake, from Voodoo Doughnut which is an independent doughnut shop based in Portland, Oregon. It is known for its unusual specialty doughnuts, eclectic decor, cash-only payment and pink boxes featuring the company logo and illustrations of voodoo priests. 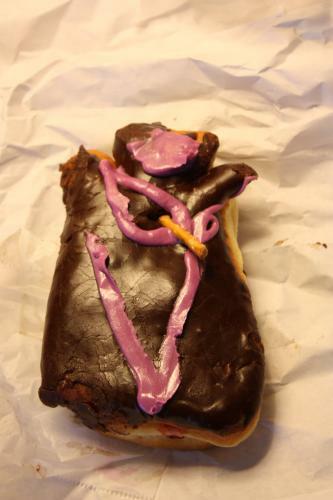 Interestingly, Voodoo Doughnut also offers legal wedding services, with doughnuts and coffee included for the reception. I visited Voodoo Doughnut's original location at 22 SW 3rd Avenue during my Jetblue AYCJ trip to Portland, OR in 2010.